Click the image to see the International Monetary Fund's predictions for global economic growth. The world's largest economies are losing momentum. Recent data shows slowing growth in the United States and China, while Europe's recession is still underway. Japan has announced a massive stimulus program, but it's not likely to grow much this year either. Meanwhile, global economic bellwethers like Caterpillar (CAT), FedEx (FDX) and even McDonalds (MCD) have all recently cited the sluggish world economy as a challenge to their businesses. "We're seeing a slowdown here, and it's real, in the sense that you're seeing it everywhere," said Jay Bryson, global economist for Wells Fargo. Last week, the International Monetary Fund cut its outlook for global growth. It now believes the world economy will grow only 3.3% in 2013. Even that prediction is considered overly optimistic by other economists. What's going on here? Right now, it's tough to say whether the slowdown is a temporary blip in the business cycle or the start of a more persistent trend. The United States has been through several "spring slumps" over the last few years, where the economy starts the year off strong, only to slow a few months later. That already seems to be the case in 2013. Job growth waned, the housing recovery lost some steam and consumers cut back on spending in March. New data released Tuesday shows American factories reporting their weakest growth in six months in April. Who's to blame? The government's across-the-board spending cuts have only just begun, and will total $85 billion through September. They're expected to prevent the U.S. economy from growing beyond 2% this year. Could colder than usual spring weather also be a culprit? What about the end of the payroll tax cut? Economists point fingers at those factors too. Across the Pacific, China's manufacturing sector also reported weaker growth. That disappointing news follows earlier reports showing that the broader Chinese economy grew at a slower pace in the first quarter. Part of the problem there comes from weaker global trade. Whenever the U.S. and Europe are slow, the domino effect hurts Chinese exports. Chinese authorities have also been reluctant to stimulate their economy, amid concerns about rapid credit growth and fears of a property bubble. Meanwhile, the euro zone is still stuck in a recession. Even Germany, the largest of the European economies, saw its services and manufacturing sectors contract in April. 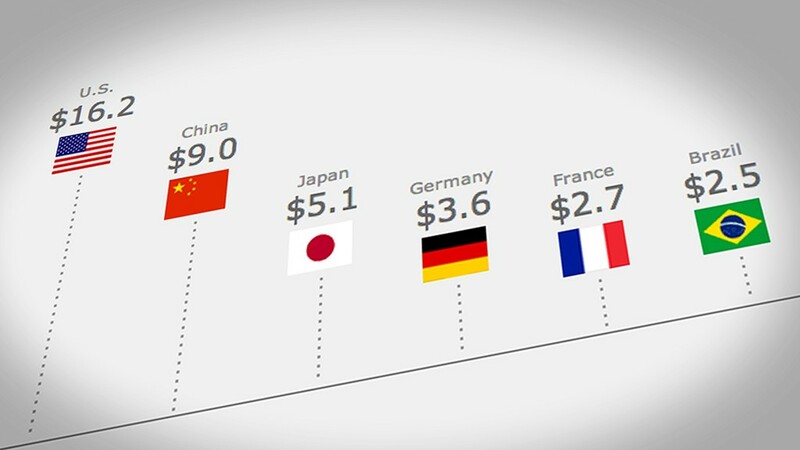 Japan is the exception to the other large economies, in that the country recently launched a large stimulus program. Known as "Abenomics," the brainchild of Prime Minister Shinzo Abe includes large public spending programs and easier monetary policy from Japan's central bank. Even with that policy in place though, Andrew Kenningham, senior global economist at Capital Economics, said he expects the Japanese economy to grow a meager 1% this year. "The massive monetary stimulus should lead to higher inflation in the short term, but it is not clear that it will lead to stronger economic activity," he said. Japan's problems remain structural, he thinks, pointing to the country's demographics. Japan's aging population and shrinking labor force signal more tepid growth ahead. Weak economic data could push more countries to enact stimulative policies, said Allen Sinai, chief global economist for Decision Economics. Yields on government bonds for Italy, Spain, Portugal and Ireland recently fell to their lowest levels in more than two years, on expectations that the European Central Bank will cut its key interest rate in the coming months. Even if more stimulus is in the pipeline though, the effects come with a lag. Sinai warns that the global economy could look weak for months to come. "We'll have to be patient," he said. "The question is, is this temporary, or is the world economy going to hell in a handbasket? I don't think we're going to get an answer to that soon."